Absolutely Cultured is bringing the streets and buildings of Hull to life with a playful and epic summer event, Dominoes. An internationally acclaimed, celebratory event, Dominoes will take over Hull city centre, engaging with its architecture on a 3.5 km domino run for all to enjoy, on Saturday 11 August 2018. The event is free and unticketed. Dominoes will weave its way through streets, public squares, civic buildings and private homes, climbing stairs, falling from windows and occasionally conquering the impressive structures that punctuate the route, which are built from yet more blocks. 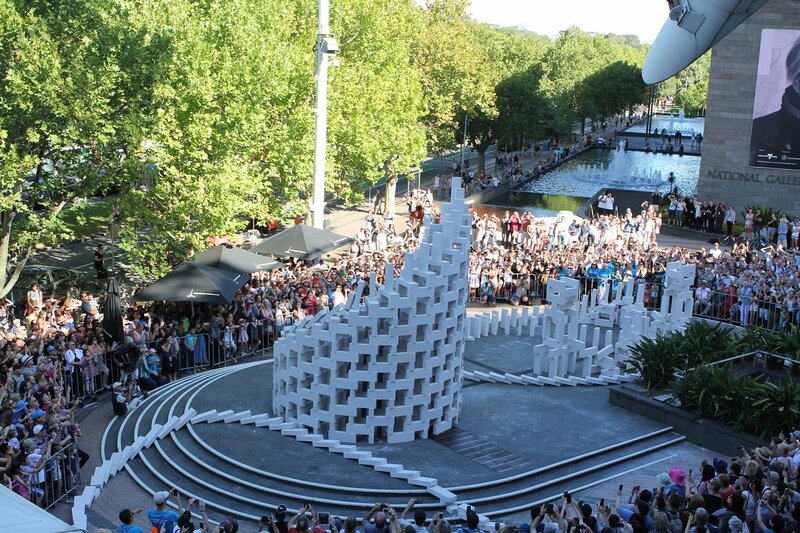 The day will begin at 12 noon, where spectators can watch the domino run being assembled. 450 City of Culture Volunteers will be working alongside Station House Opera’s Artistic Director, Julian Maynard Smith, to install the incredible structures, using over 12,000 breezeblocks. Once constructed, spectators can explore the full route with all the structures in place from 2:30pm and can even gain access to some of the interesting and not frequently accessed spaces of the city, such as The Guildhall and the Boat Yard at Hull Marina. Absolutely Cultured have advised audiences to plan their time and find their favourite spot to watch the domino run in action. A detailed map is available to download below and printed maps will be available on the day. At 4:30pm the first domino will be pushed at the Boat Yard; this will create a chain reaction across the city, a moving sculpture that will last around 60 minutes. Spectators can watch as the dominoes wind down streets, tumble from balconies and conquer massive sculptures along the way. In a first for Dominoes, the route in Hull is split into two sections which are linked by vehicle. Starting in the Boat Yard at Hull Marina, the first section pauses in front of Burt’s, the new Pizzeria and Gelato restaurant near the Fruit Market, from here a vehicle will take a block along the A63 to re-start the run in Australia houses on Great Thornton Estate. The domino run will finish in Queens Gardens, where YUM! Food and Drink Festival is also taking place over the weekend – even more reason to make a day of it. One of the Hull 2017 Major Partners, MKM, has demonstrated continued support for the City of Culture legacy, by generously supplying the blocks for Dominoes. Following the event, the blocks will be donated to local charities. Katy Fuller, Creative Director and CEO of Absolutely Cultured, said: “Dominoes will be a heartfelt celebration of the diverse spaces of this glorious city centre. It will draw a line joining the Mecca Bingo to the grandeur of City Hall, the playful fun of Atik nightclub’s light-up dance floor to the serene calm of Trinity Minster. Hull has proved once again that it’s a city which allows things to happen; everyone we’ve approached for permission to run through or across their property has been so supportive for which I’m hugely grateful. Councillor Stephen Brady, Leader of Hull City Council, said: “2017 was filled with spectacular, jaw-dropping and ambitious events and I’m sure Dominoes will be no different. We are incredibly proud to have a nationally and internationally recognised arts organisation based and commissioning events in our city – it shows how far the city has come in recent years that we can now bring these world-class events to Hull. Dominoes is conceived and directed by Station House Opera, produced by Artsadmin. Absolutely Cultured would love everyone to share pictures and videos from the day across social media, use @abscultured and #DominoesHull to join in the conversation. Volunteer stewards will be on hand on the day to answer questions and to hand out the maps; spectators must ensure they follow any directions given by them. If a spot feels too crowded, then move along the route. There will be a number of road closures on the day; formal notifications have been issued and updates will be available here. FAQs about Dominoes can be read on our Frequently Asked Questions page. 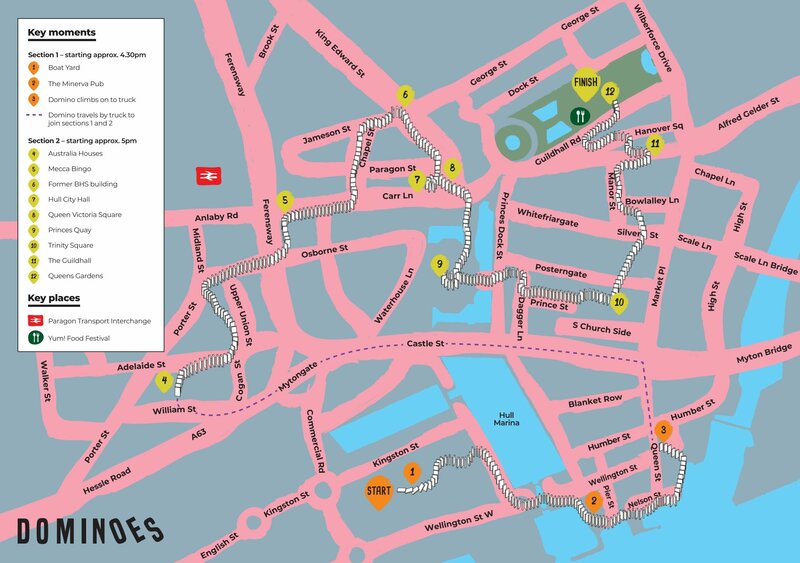 Download the Dominoes route map below and plan your day!